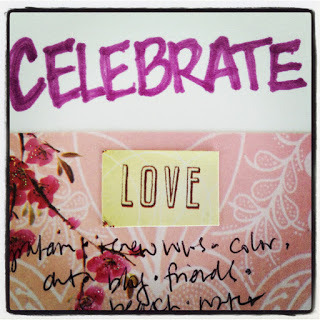 In February my One Little Word journey takes me from Celebrate :: Now to Celebrate :: Love. Its funny how these words are stringing together in unexpected ways. While marinating with Celebrate :: Now I realized that as our oldest daughter nears nine years old, she's half way to eighteen. And I suddenly had that feeling that time collapsed. I have joined the ranks of seasoned parents (aching with nostalgia for what was sweet and for what went undone) who claim to novice parents (exhausted with sand paper eyes, surrounded by the faint smell of spit up that somehow never dissipates, staring back in disbelief), "it all goes so fast." And what I realized is that now is the time, as it always is, to embody what I aspire to create for my family. Time is passing and the openness and magic of our girls' childhoods will flow by us. I also realized that love to me in 2013 feels very different than it did in 2000 when I got married. And to address those two thoughts, somewhat surprisingly, Graham and I have decided to renew our wedding vows. Knowing that I'm a wedding Celebrant and that I love weddings, people have asked me in the past if Graham and I would renew our vows, and the idea has appealed to me, but I never felt like I knew how or why I would do it. We're going to do it simply, just the five of us in a place that we love. The only thing I'm sure about is that whatever plan we end up with will not be the thing that actually happens. This is an experiment, and the uncertainty of it is something I'm trying to embrace. May we all do something a little uncertain on this day that celebrates love...Happy Valentine's Day!